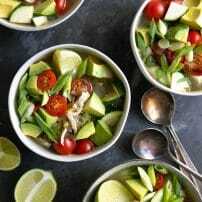 Avocado Soup– beat the wintertime blues with a bowl of this Easy Chicken Avocado Soup. 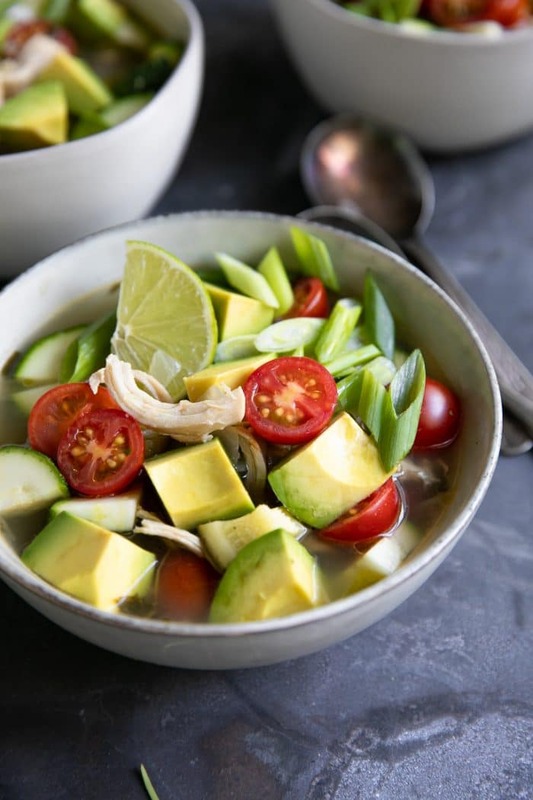 Made with a comforting cilantro-lime chicken broth, juicy shredded chicken, zucchini, and cherry tomatoes, this avocado soup recipe is a fun and healthy alternative to classic chicken noodle soup. Sometimes, I just want a big bowl of brothy, delicious, uncomplicated soup. This is true year-round but come fall and wintertime, well, soup and I are pretty much bffs. A fan of all soup varieties, I am especially drawn to the broth-filled versions. Lighter than cream based soup, brothy soups allow more room for bread, toppings, and seconds. 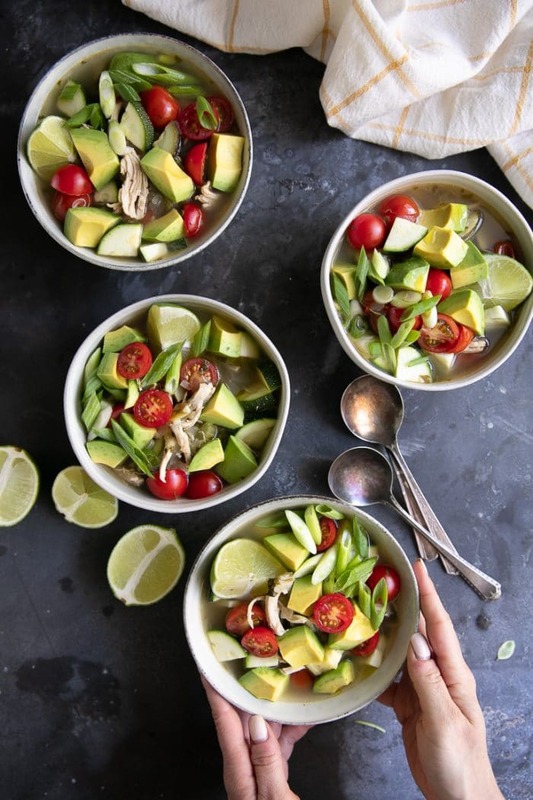 This avocado soup allows for all those things, but also comes packed with fresh Mexican flavor and just the right amount of heat. Plus, it’s dairy-free and gluten-free. I like to think of it as a less complicated tortilla soup with WAY MORE avocado and ZERO CARBS. Actually, there are some carbs, but not the processed kind. I have made this avocado soup several times and a handful of different ways and each time it gets better and better. The most important ingredients in this avocado soup include the zucchini, avocado, cilantro, onion, and fresh lime juice. The tomatoes and chicken are also pretty vital to the make-up of this delicious soup, but more on that next. To make this soup, as written, you will need chicken. I added two large chicken breasts and it was just the right ratio of chicken to zucchini to avocado. I boiled my chicken breasts directly in with the soup broth and shredded the meat after it was cooked, but feel free to use leftover rotisserie chicken or boil in a separate pot. Replace the chicken broth with vegetable broth. I always start my soups by first sautéeing the onions until soft and translucent, followed by adding the fresh garlic, spices and seasoning, and tomatoes. Allow the onions and tomatoes to cook with the spices for a minute or two before adding the chicken broth and boiling. Boil and add the chicken breasts to the broth and cook for 30 minutes. 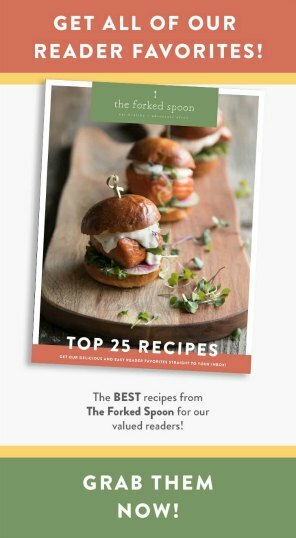 This is the best time to prepare any remaining ingredients or garnishes that you plan to serve with the soup. Once the chicken is cooked, remove from the pot to shred and return again. Finally, add the zucchini, lime juice, green onion, and cilantro. When is the best time to add the avocado? This all depends on personal preference. 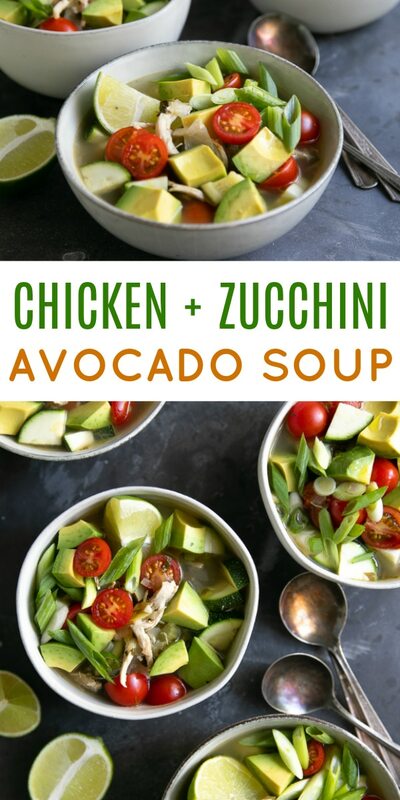 For me personally, I add the avocado to this chicken and avocado soup just before serving. That’s not to say that avocado can’t or shouldn’t be boiled (it can), it’s more of a hot/cold thing for me. With that said, should you add the avocado directly to the pot and find yourself with leftovers, simply store the remaining soup in a sealed container and reheat as desired. Can this avocado soup be frozen? Absolutely! However, I recommend not freezing the avocado with the soup. Technically you can freeze avocado, but frozen avocado works best for things like sauce or dips. In other words, the consistency of the cubed avocado will likely change. 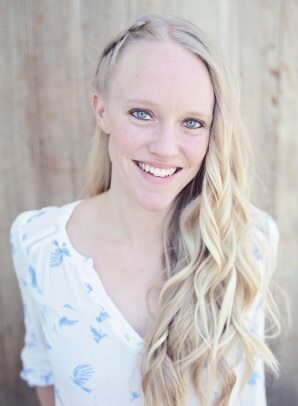 Unfortunately, I can’t guarantee if this change will be agreeable FOR YOU. 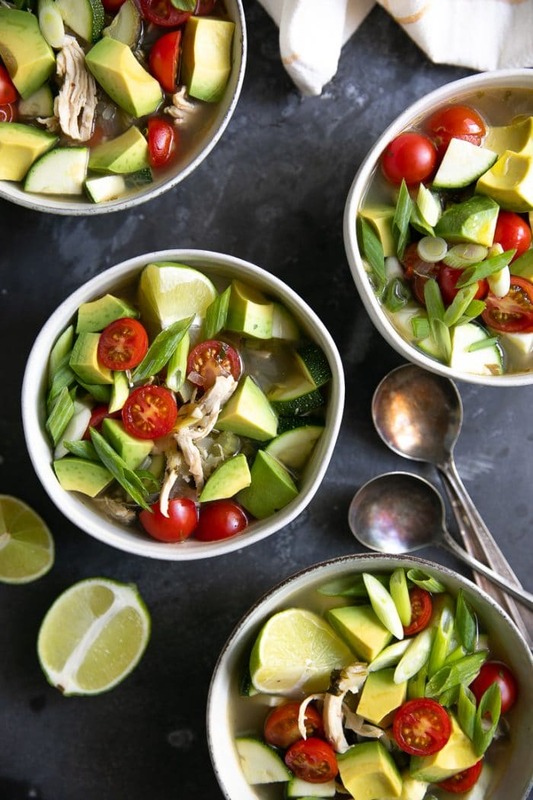 DON’T FORGET TO PIN THIS CHICKEN AVOCADO SOUP RECIPE AND SAVE IT FOR A RAINY DAY. 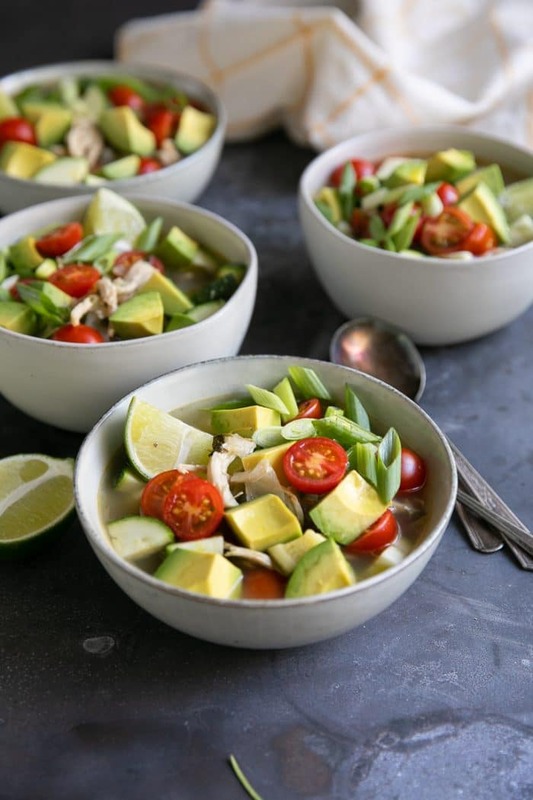 Beat the wintertime blues with a bowl of this Easy Chicken Avocado Soup. 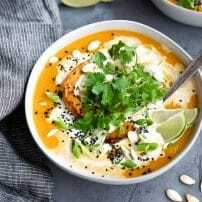 Made with a comforting cilantro-lime chicken broth, juicy shredded chicken, zucchini, and cherry tomatoes, this soup is a fun and healthy alternative to classic chicken noodle soup. Heat olive oil in a large pot or Dutch oven over medium-high heat. Add the onions and shallots and mix well to combine. Sauté for approximately 2-3 minutes, or until tender. Add the celery and jalapeño to the pot and stir to combine. Cook an additional 2-3 minutes, stirring often. Reduce heat to medium and add the garlic, ground cumin, salt, pepper, and cherry tomatoes. Stir well to combine. Cook for 1-2 minutes, stirring often. Increase heat to high. Add the low-sodium chicken broth to the pot and bring to a boil. Add the chicken breasts to the soup and covering completely with the broth. Cover the pot and reduce heat to low. Allow soup to simmer for 30 minutes. After 30 minutes, remove the lid and carefully remove just chicken breasts from the pot onto a clean plate or cutting board. 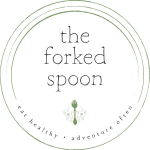 Once cool enough to handle, shred or chop the chicken breasts using two forks. Return the chicken back to the pot. 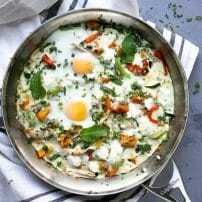 At the same time add the zucchini, green onion, cilantro, and lime juice to the pot and stir to combine. Cover and simmer for approximately 5-7 minutes, or until zucchini just starts to soften. Remove from heat and season with additional salt, pepper, or lime juice, to taste. 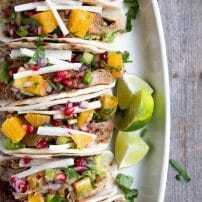 Serve each bowl with chopped avocado and sour cream, cheese, and additional cilantro or green onion, if desired. Enjoy!